The DVO Emerald uses a Tapered 1 1/8″ to 1.5″ steer tube. Your frame must have a straight 1.5″ head tube or a tapered 1 1/8″ to 1.5″ head tube. Depending on your frame manufacturer you will either have a external cup press-fit or integrated style headset. 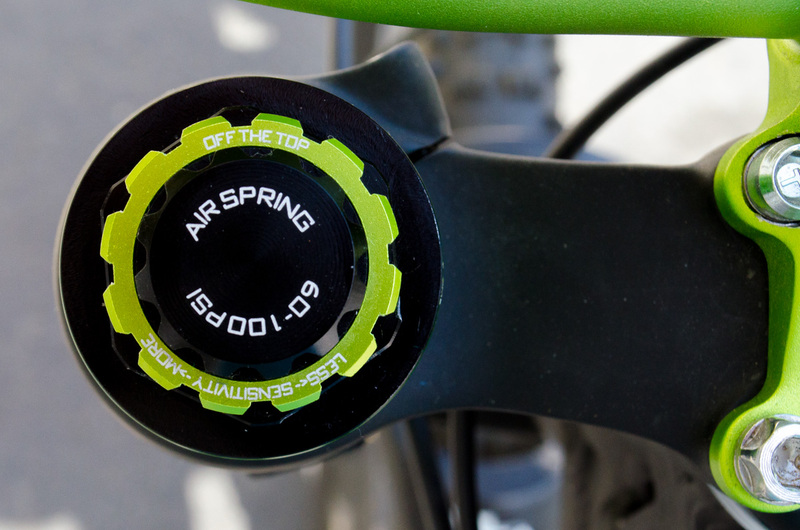 Please contact your bike manufacturer to make sure you have the correct headset configuration that can accept a tapered steer tube for your frame. ZS56 – Internal headset lower 1.5″. Internal cups press almost completely into the frame. These are often preferred for their low stack height and clean look. IS52 – Integrated headset lower 1.5″. A bearing (usually a sealed cartridge unit) sits directly into the frame eliminating the need for cups. Found on many carbon fiber bikes today. 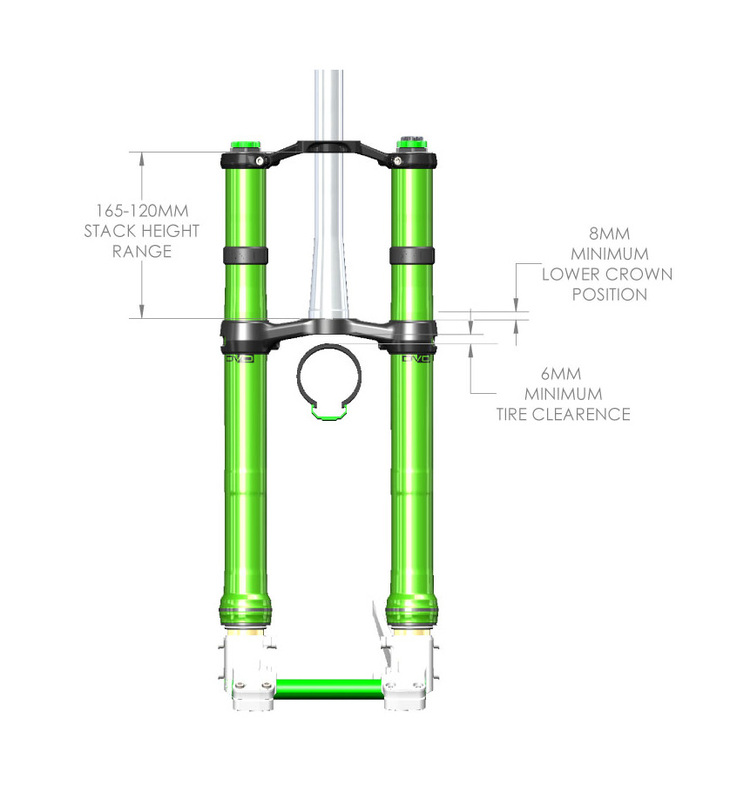 All DVO Suspension forks come with a threadless steer tube. Do not add a thread to it! DVO Suspension fork steer tubes are for one-time press fit only which cannot be removed. Do not try to replace the steer tube with a threaded steer tube. This will void the warranty of your fork and result in a failure of the product or cause serious injuries or even death to the rider. Note! All fixing bolts have to be tightened with the proper fastening torque stated by the manufacturers. 1. Remove front brake from fork and existing fork from your bicycle. Afterwards remove the headset crown race from the fork. 3. Remove top and bottom clamps from fork assembly to ensure proper mounting. 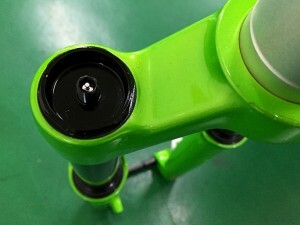 Install the lower fork clamp on to the bike with all the headset parts included and a minimum 3mm spacer on the top of the headset. 4. Install the lower fork clamp on to the bike with all head set parts and a minimum 3mm spacer on top of the headset, then the upper fork clamp. 6. Install front wheel back on your bike. Insert the axle into the right drop-out / non-disc brake side then tighten axle bolt to the appropriate torque value of 7 N.m / 62 in.lbf. Leave drop-out pinch bolts loose until step #9. 7. 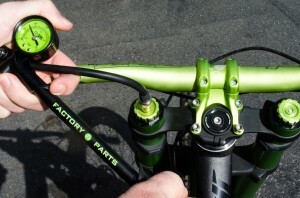 Install the front brake according to the manufacturer’s instructions and fasten brake line to guard. Make sure you adjust the brake pads properly. Ensure that brake line length is the appropriate length to not effect steering or compression and extension of fork. 8. Remove bike from stand. With the front brake on, lightly rock the fork back and forth to ensure the headset preload is at the appropriate torque value. Now tighten the upper fork clamp bolts to the appropriate torque value of 7 N.m / 62 in.lbf. 9. Holding the front brake, using your body weight compress your fork. Do this a few times to allow the fork legs to self-align on the axle. Now tighten the drop-out / axle bolts down to the appropriate torque value of 7 N.m / 62 in.lbf. 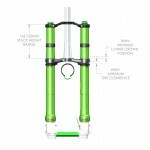 DVO Suspension forks are designed around both 26” and 27.5” tires; make sure you have the correct wheel size for your fork model. Each tire and manufacturer has a different outer diameter (tire width and height). Therefore the clearance between your tire and fork needs to be checked to make sure it does not come in contact with any part of the fork. Inadequate tire clearance will result in an accident, personal injury or death. 1. Release all air from your fork. 3. Measure the distance between the top of the tire and the bottom of the crown. Make sure this gap is NO LESS than 6mm! Exceeding maximum tire size will cause the tire to jam against the bottom of the crown when the fork is fully compressed. 4. Inflate the fork again. Keep in mind that if you are using a mudguard the clearance can be even more limited. Repeat the “Tire Clearance Test” again to make sure the gap is big enough. Every time you are going to change your tires you have to repeat the test. SAG is the amount your fork compresses under your body weight (don’t forget to include your riding gear), also referred to as Rider Weight. Since this is a Downhill specific fork, measure SAG by mounting your bike with your riding gear on, standing up and in the ready position. The ready position is basically, knees and elbows slightly bent, bars weighted but body weight on your feet. Do not sit on the saddle while measuring SAG. Every rider has a different riding weight and ready position based on rider height and style. 1. Before adding air to the fork make sure that both high speed and low seed compression is turned all the way counter clockwise and release all the air out of the fork. 2. Set the correct amount of rotations to the OTT knob based on your weight. Refer to the OTT Guide or basetune to find the recommended setting for OTT. 3. Add the recommended air pressure to the fork based on your weight. Refer to the basetune to find the recommended air pressure setting. For detailed instructions on measuring and setting up sage check out this video and step by step instructions. Why do you need SAG? Sag is how far your suspension compresses when you sit on your bike. Sag is set to insure that the suspension works in its most effective range and to keep a good weight balance, front to rear. It can also determine if you have the proper spring rate. Proper sag is essential because it allows the suspension fork to absorb holes and bumps without making the fork too soft or hard. What happens if you have too much SAG? What happens if you have too little SAG? The quality of the ride will suffer. The suspension will feel harsh on small bumps, traction will be reduced and you may not be able to use all available suspension travel. Rebound controls the speed at which the fork extends after compression. Turn the knob clock-wise for SLOWER rebound and counter clock-wise for FASTER rebound. 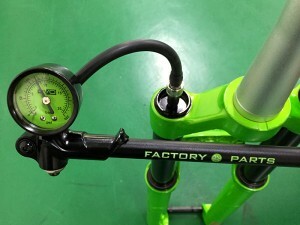 Rebound damping control is relative to the amount of air pressure used. Higher air pressure requires more (slower) rebound damping and a lower air pressure will require less (faster) rebound damping so please adjust accordingly.